The Lick Creek Summit Yurts are ready to go by early December and we operate until April. Come join us for a powder skiing experience you'll never forget! Located in the heart of Idaho's West Central Mountains, we have over 30,000 acres of untracked powder, literally, in our backyard. Located on Lick Creek Summit (elevation 6930' ), we have two yurts, a wood fired sauna and an outhouse. From mellow burned tree glades, to the steep and deep, you'll find loads of vertical just out the door. We can accommodate your perfect backcountry ski trip, from a day to a week. 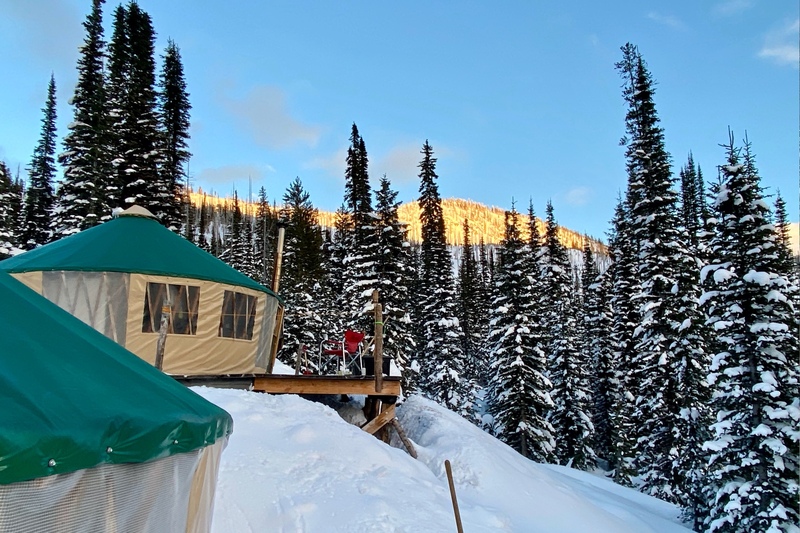 We offer yurt rentals, full service guided trips and avalanche education courses. Access to the yurts is by snowmobile and/or snowcat, enabling backcountry skiers and riders to focus on skiing untracked snow. Our snowmobiles are four stroke touring sleds equipped for two backcountry riders and their gear. 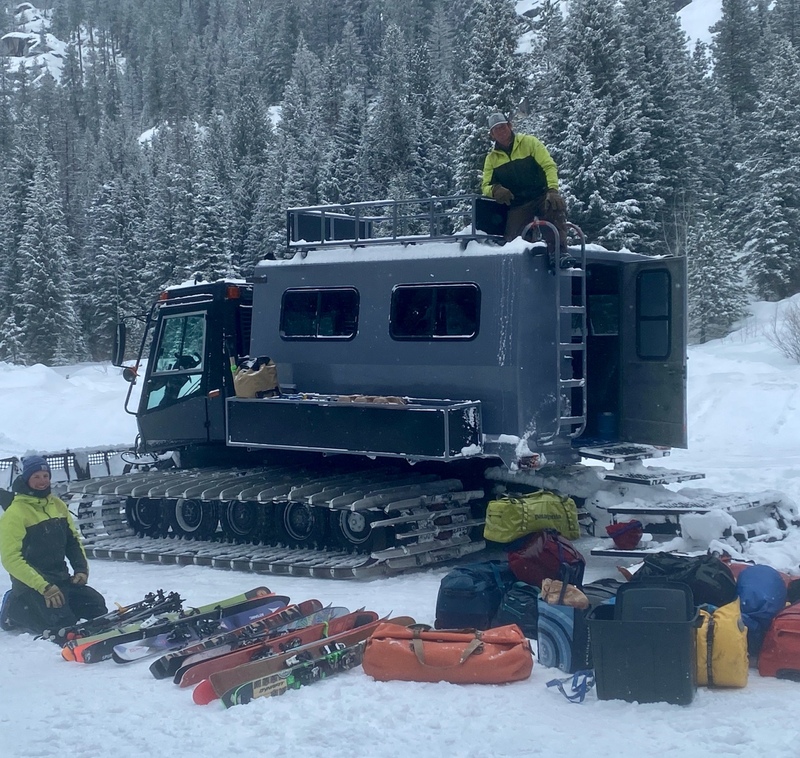 Our snowcat is bio-deisel fueled and can carry all of your gear and your group, river trip style, right to our yurts. Transportation is from the trailhead to Lick Creek Summit Yurts, and includes 75 lbs. of gear per person. Introductory Yurt Tour - $400 fee, required for first time self catered groups. Waived when using PPG transportation. A $100/night deposit is required for a private yurt reservation. Trips will be reserved when deposit, by cash, check, or credit card is received. All trips must be paid in full 30 days prior to trip. Participant information sheets and signed release waiver also required at that time..
All self catered yurt rental groups will be required to have a Trip Leader. The Trip leader must have a Level I Avalanche Safety Course or equivalent. 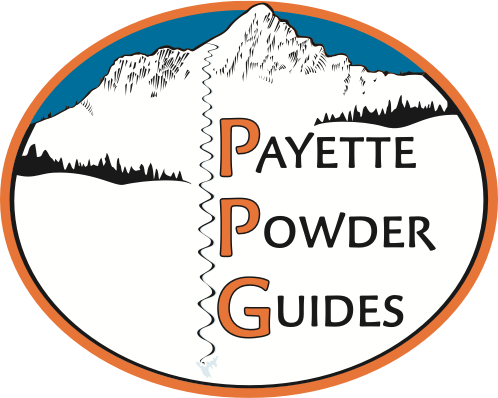 Payette Powder Guides will evaluate the equivalent experience to determine if it is satisfactory. Trip Leaders must be familiar with the terrain in the proximity of the Lick Creek Summit Yurts. If they are not they must hire a guide to give an introductory hut tour of the area. Trip leader will ensure that one fully stocked First Aid Kit is available to the group and that at least one person in the group has First Aid/CPR Training. A Trip leader will be the contact person for PPG and will be responsible for submitting the Registration Packet (to include: payment, participant information sheets, signed Yurt Rental Agreement, and signed waivers) prior to trip. All Trip Leaders of self catered groups will be required to have a Pre-Trip Meeting. All group members with last minute payments, incomplete paperwork, or additions to trip, will be required to schedule a Pre-trip Meeting. IF PAYMENT IS NOT RECEIVED BY DUE DATE (30 DAYS PRIOR TO START OF TRIP), YOUR RESERVATION MAY BE CONSIDERED CANCELLED. IF YOUR RESERVATION IS CANCELLED, YOU WILL RECEIVE A 75% CREDIT FOR A FUTURE RESERVATION, ONLY IF WE CAN FILL YOUR SPOT. IF YOUR DATES ARE NOT FILLED YOU WILL FORFEIT YOUR PAYMENT. NO REFUNDS. DUE TO THE NATURE OF OUR BUSINESS, IN AN UNPREDICTABLE WINTER ENVIRONMENT, ALL TRIPS HAVE THE POTENTIAL FOR DELAY, RELOCATION, OR CANCELLATION DUE TO EXTREME WEATHER OR AVALANCHE CONDITIONS. FULL CREDIT FOR A FUTURE RESERVATION WILL BE GIVEN IF WE CANCEL DUE TO EXTREME WEATHER OR AVALANCHE CONDITIONS. NO REFUNDS, UNLESS WE CANCEL CLASSES OR TRIPS DUE TO INSUFFICIENT RESERVATIONS, IN WHICH CASE YOUR PAYMENT WILL BE REFUNDED.